Designation sets the stage for a collaborative recovery planning process to Bring San Francisco’s “Miracle Manzanita” Back from the Brink of Extinction SAN FRANCISCO— In a major advancement in one of San Francisco’s most important biological discoveries, the U.S. Fish and Wildlife Service will announce tomorrow the final critical habitat designation for the Franciscan Manzanita. The designation includes approximately 200 acres of land that provide the best, and possibly last opportunity to bring San Francisco’s namesake manzanita back from the brink of extinction. The last wild Franciscan manzanita—but not for long! “Species with critical habitat designations are twice as likely to recover as those without,” said Brent Plater, Executive Director of the Wild Equity Institute. “This announcement will help us all bring this incredible story to a happy ending: a fully recovered species no longer needs protection under the Endangered Species Act, just as we’ve done with our Bald Eagle, Brown Pelican, and Steller Sea Lion populations.” Under the Endangered Species Act, the protection of a species’ “critical habitat” is closely tied to the ultimate recovery of the species. Because much of the Franciscan Manzanita’s historic habitats have been destroyed by unsustainable development, the Fish and Wildlife Service’s critical habitat designation emphasizes areas that are suitable for reintroduction or the establishment of new populations that have suitable habitat characteristics. The final critical habitat designation includes five areas within the Presidio Trust (Fort Point, Fort Point Rock, World War II Memorial, Immigrant Point, & Inspiration Point) and six areas within San Francisco Recreation and Park Department and other lands (Corona Heights, Twin Peaks, Mount Davidson, Diamond Heights, McLaren Park, & Bayview Park). In the largest change from the critical habitat proposal released earlier this year, the Fish and Wildlife Service removed all areas of Bernal Heights Park from the critical habitat designation. San Francisco’s Recreation and Park Department had allowed the park to become “highly degraded” by unsustainably high use, making it impossible for conservation efforts to succeed at that park. The Fish and Wildlife Service also excluded areas that do not contain habitat for the species, such as roads, gun batteries and 1.4 acres of forest in the Presidio; heavily degraded off-leash dog play areas at Corona Heights; and areas in Diamond Heights, Bayview and McLaren Parks that do not have needed habitat conditions for the Franciscan Manzanita. Today’s announcement also addressed some myths about critical habitat. It stated that critical habitat designations only affect federal activities: private landowners therefore will have no additional regulatory constraints unless they attempt to conduct federal projects on their lands. It also reaffirmed the scientific basis for designating portions of Mount Davidson as critical habitat, finding that appropriate geologic and soil conditions exist there for the species to thrive. “Now is our opportunity to show the world that great cities can thrive without destroying indigenous plants and animals,” said Plater. 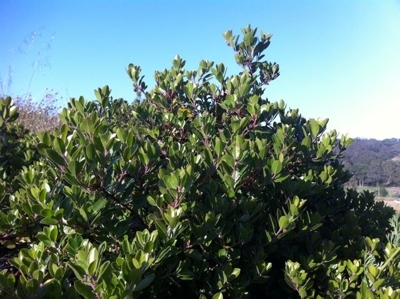 “By collaborating with educational institutions, fish and wildlife agencies, and conservation groups, San Francisco can demonstrate that it is truly committed to sustainability for all.” Background In 2009 Dr. Daniel Gluesenkamp rediscovered the Franciscan manzanita, presumed extinct in the wild for over 60 years, while exiting the Golden Gate Bridge into San Francisco. This subtly charming flowering shrub was only known from San Francisco, but it was tragically lost despite heroic acts by botanists striving to keep the species alive. In a last act of desperation, in 1947 botanists stood in front of earth-moving equipment to wrest the last known wild plants from a construction site. The plants were sent to a botanical garden, and no one found the plant in the wild again: until Dr. Gluesenkamp’s miraculous discovery. The individual plant was subsequently moved to a more secure location in the Presidio to avoid disturbance from the ongoing construction of the Doyle Drive project. While the individual plant was saved from immediate threat, no formal protection was provided to ensure the entire species recovered. The Wild Equity Institute therefore petitioned the Fish and Wildlife Service to protect the species under the Endangered Species Act. The Fish and Wildlife Service agreed, protecting the plant as endangered and proposing to protect its critical habitats in 2012. The full story of the plant’s rediscovery and path toward recovery is available here. The Endangered Species Act requires creation of a binding recovery plan for the species; it prioritizes federal funding for the species’ recovery efforts; and it ensures that the species’ critical habitats, both those currently occupied and those that are needed for reintroduction, are protected. Together, these protections have made the statute the most successful conservation law in the world. For more information about the Franciscan Manzanita, please visit our website at wildequity.org.